Fancy Saddle Pads — are They Worth it? Although I am an admitted saddle addict, I am not a saddle pad addict. I know people who own multitudes of colors . . . have gel pads, riser pads, sheepskin pads, and correction pads. It’s come to the point where saddle pads now cost more than some of the saddles I’ve owned. I mean really, there is a Mattes Correction Pad on the SmartPak site right now for $405 and a Thinline endurance pad for $350. On Dover, you can buy a Tad Coffin leather half pad for a mere $425. Mostly, I believe that if your saddle fits, the main purpose of the pad is to keep the bottom clean. But, I will admit to two things. First, I bought and tried a lot of the fancy pads and second, while I’ve mostly moved away from them, there are a couple I still like. After riding on a hot day, I simply hose down the pad. If I were to buy only one pad, my first choice is my Supracor half pad. 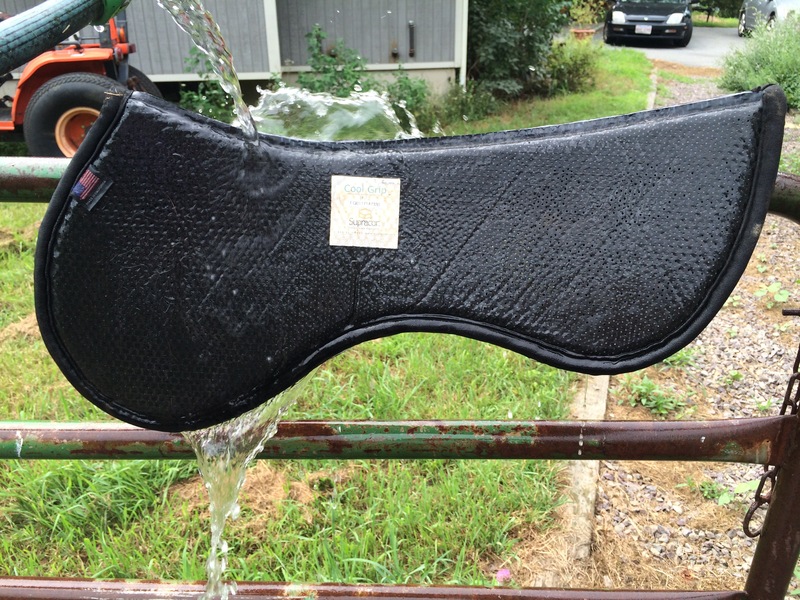 It is designed to absorb impact, keep your horse’s back cool and it is really, really easy to clean. You just hose it off. I’ve had two of them now for about 6 years and they haven’t compressed and they look exactly like they did when I bought them. Now, they aren’t cheap. The half pad that I use retails for close to $200. That’s why I bought mine lightly used on eBay for around $90. 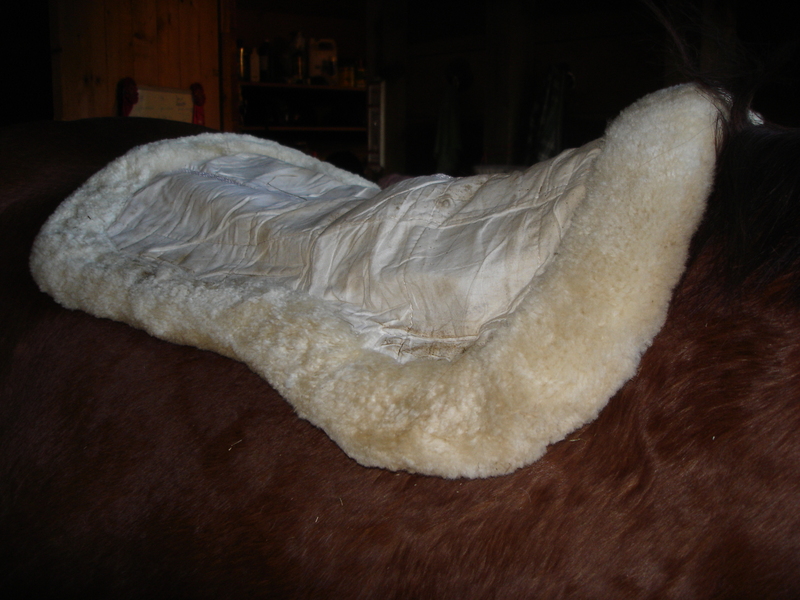 A sheepskin half pad can provide extra protection to your horse’s back. Sheepskin is a great choice because it also wicks moisture away and keeps your horse more comfortable. My second choice pad is real sheepskin. I’ve had several sheepskin half pads for more than a decade. They absorb moisture and do an excellent job of cushioning. I wash mine in my washing machine in cold water on the delicate cycle and they’ve always come out fine. Of course, you can’t put them through a heated drier, but you can air fluff most of the moisture out. I keep a Mattes Correction half pad as a back up for those times when I know saddle fit is a bit off and I’m waiting for my fitter to come. It was particularly useful when Zelda was a bit asymmetrical because I could shim one side while I was working with her to even out her musculature. I think the correction pads (available from lots of companies now) are a great advancement. However, to make them work properly, you do need to understand how a saddle should be balanced. I see many saddles that have more pads than the princess and the pea and which still don’t fit. So, which pads have I moved away from? Gel pads. I can remember when those were popular! I had this thick heavy gel pad that wasn’t breathable and probably added more pressure points than it relieved. I think this pad works to absorb impact and it’s a very nice looking pad. But it’s impossible to wash. That’s a deal breaker for me. The manufacturer suggests the pad will last about 7 years if you take proper care of it — that means always putting it over a baby pad and only washing it 2-3 times total. Thinline pads. I still have a combination thinline/shipskin halfpad that I think is quite nice. I liked to use it out hunting because I think it did a good job of absorbing impact and has a nice traditional look. Unfortunately, I never figured out how to get it clean. Even the manufacturer says you should only use it over another pad to protect it. Pads should only be washed when absolutely necessary, which should only be about 2-3 times in it’s lifespan if the above maintenance care is followed. You can’t hose it off and you can’t stick in the washing machine. Coming back from a foxhunt, everything is dirty so I keep that one as a “just in case” pad but rarely use it. I wouldn’t even own one except that I bought mine from the clearance area at SmartPak! These are beautifully made leather pads that do not compress over time. If you have a saddle that is a bit too wide, this can be a lifesaver. but only cost $300. They are made from a non compressible foam and have a very nice leather cover. My problem was that they change the way your saddle fits, so they are only really suitable if your saddle is slightly too wide. I kept one in my tack trunk for many years but finally sold it on. They hold their value well and there are usually some on eBay for less than retail. 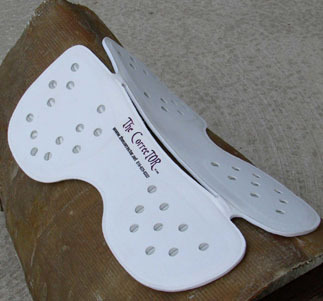 The Corrector pad provides protection in the places where saddles typically create pressure spots. by having the worst website I have ever seen. Kudos to anyone who can get their way through it. This pad uses protective shields/discs that are built into the pad where a saddle typically creates pressure points. Once again, my experience is that if your saddle fits, you don’t really need this. 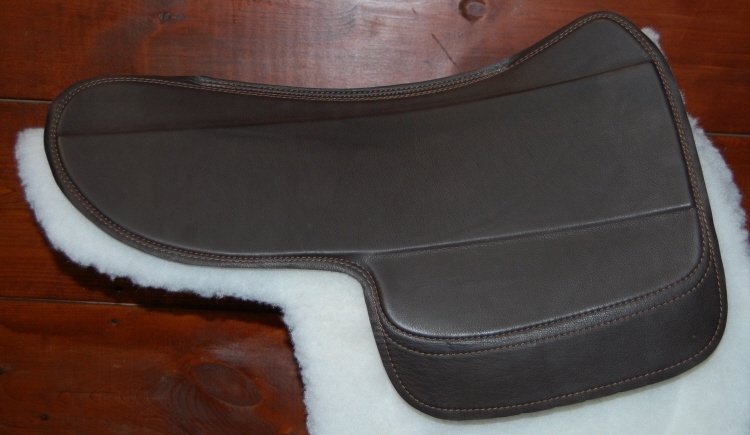 Len Brown says that this pad will make any saddle fit, even a saddle that is too narrow. I don’t buy that, but many people seem to like these pads a lot. They come with shims so you certainly can use them to fix a saddle that’s too wide. It’s certainly a nice idea that you could spend $350 and have every saddle fit going forward. Caveat: He is marketing a newer product than the one I own, and I haven’t had the chance to try it. 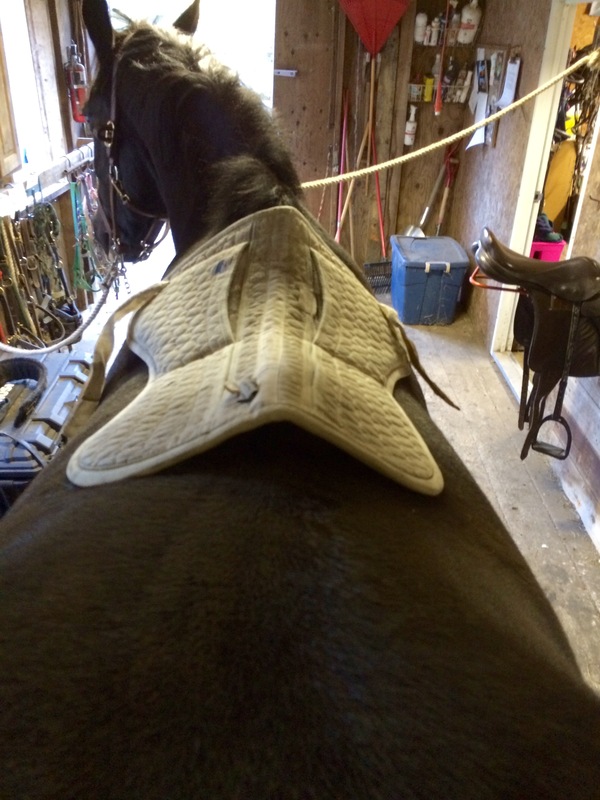 So tell me — what’s your favorite saddle pad, and why? Did you invest in one of the new technological pads or are you more traditional in your choice?